“Je porte bonheur”.. .says this little bunch of muguets(lily of the valley). A beautiful custom in France is to give a small bouquet of these to anyone and everyone you want to, on the 1st of May, that way, wishing good luck and happiness to all. Of course it is also a public holiday..worker’s day I think in English. Since I love the idea, I’m offering this bouquet of muguets to all EDM- friends – to those with special projects for May, like a drawing a day, to those who have a work on exhibit, to those who wish to exhibit, to those whom we’re voting for everyday, to those who are wonderful professional artists, to those who are doing art for the fun and joy it brings them, to those who started up this great site, to those who keep it up faithfully and in great spirit week after week, to those who add fun and joy , originality, spirit and character to this art site….to all who participate and bring beauty to look at, inspiring words to read, jokes to laugh at, advice to grow….to all at EDM; wishes of happiness to you all in this beautiful month of May! Don’t you mind if i add you to be my link. Hi Ronell, thanks… I like this idea. We have this custom in Belgium too, although I do not see this as much anymore…maybe one reason is these little flowers are far to overpriced this day. I realy like this drawing. Merci, Ronell! Et a vous, aussi, mes voeux de bonheur! Thank you Ronell, I found you through EDM and I love your work – I actually identify a lot with it, since I also love working with watercolours and ink. I’ll be visiting you often! WOWZA!! What a wonderful tradition and even more glorious painting!!! THANK YOU!! You’ve begun the month in splendor! I love this tradition, I only wish they did that here in Canada. And to make it even more special My Birthday is this mo. so THANK YOU. As always you painting is wonderful. Beautiful painting as always Ronell, those tiny flowers look so cute! I’ve seen these lily of the valley all over the shops recently – is it the tradition to give only those? I would never have known if it wasn’t for your post, thank you. Hope you have a super day! beautiful work. thank you for the great way to start “may day”! Ronell, this tradition is also in parts of Italy. When my husband first began dating me, he looked through all the flower shops in the city to find me un petit bouquet de muguets. They are not usually sold in shops here in Canada. They are easier to find in the garden, but by now they are past their season here on the west coast. Thank you for such a lovely reminder of a very beautiful tradition. Thank you Ronell – I picked a sprig of Lilly of the Valley on this morning’s walk. May 1 is my grandmother’s birthday (deceased) and I have very fond memories of picking bouquets of these tiny flowers from her huge patch in her back yard AND I intended to sketch them today in her honor!! What a coincidence! I love the holiday you have attached to them and ON this date. Merci!! What a beautiful gesture – in every way! good luck and happiness to you too! nice to learn about different traditions and customs. great ink ‘n wash. Thank you very much! When I was a kid we always celebrated May Day, also the 1st, by picking our mothers roses and leaving flowers for all the neighbors inclucing mom of course! Ronell,Beautiful drawing and a big thank you for bringing this holiday to my attention. It has definitely brightened a gray day here. I think I’ll stop on my way home and pick some up. Happy May day to you too! (that’s what we call it here in the US). Nobody gets a day off though. My lily- of-the-valley aren’t in bloom yet. They usually start blooming around mother’s day… May 13. another week or two. I always give a bouquet of them to my mother! That’s a very generous sentiment, and a lovely painting. Thank you! Ronell, there’s not much to add. The others have already said it all for me. Beautiful drawing and WCs, as always, and a REALLY BIG THANK YOU for your sincere wishes! All the best to you too. Ronell, what a lovely painting and a lovely sentiment! We don’t have this tradition in the United States. I wish we did!! I am glad I at least got to experience it here. Beautiful custom and beautiful painting! You have a great sense of color and value — you always get your darks just right. And in this piece, it makes the little flowers look all the sweeter. Again, beautiful! Ronell, they are wonderful. We have some of them in the garden, but I did not manage to draw them. Perhaps today. what a nice idea, and a beautiful painting. Aw,Ronell, what a lovely gift. THanks so much for the beautiful bouquet and words. Happy May 1! What a beautiful custom and even more beautiful sentiments! Merci beaucoup! Forgive my rusty, stunted French. This is a beautiful little sketch! Happy May to you and may you have a wonderful summer playing tennis! Ronell,Thank you so much. Your thoughtfulness, and beautiful bouquet really touched me.As a child growing up, my mom taught my brother and I to make “May Day” baskets. We would hand make a little basket out paper and put little wild flowers in them. Then we would go ding-dong-ditch the neighbors…Leaving behind only the flower loaded basket.Thank you for the memory, and sharing your custom. Not so different from mine ;-). Thank you so much for such a beautiful sentiment! May you have a wonderful day as well. 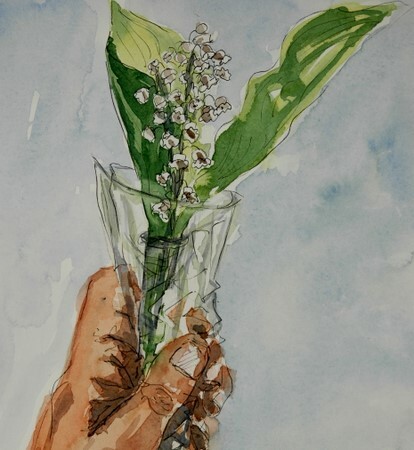 And we say “thank you for the muguet” 😀 This is a lovely post, Ronell, and a lovely sketch. I am reminded of the lily-of-the-valley perfume my grandmother used to wear … I haven’t thought of it for years … thank you.